The title of this article is ambiguous. Aliens (Disambiguation). 6.86 points at 21 votes (rank 383). Story: There are places in the Universe where you do not go on your own... but nightmares return and the only way to get rid of them is to return to LV-426 and face them. To re-experience the horror. To master the fear. And this time... to win. Here is your chance to live through the excitement and action of the film "Aliens" once more. 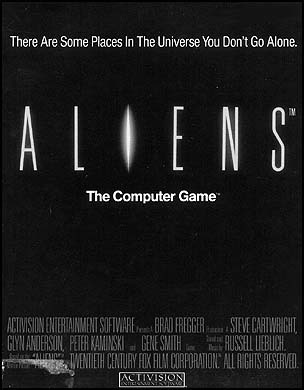 Between the original landing of the Drop Ship to the end fight with the Alien Queen, the six different game sequences put the destiny of Newt and the colonial marines into your hands. . . .
Aliens - The Computer Game by Activision is the game for the movie. Seemingly, it was only developed for the US market, as there is another game with the same name in Europe. But this game differs significantly from the other concerning the game principle. 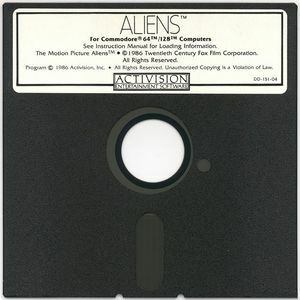 The game talked about here was later offered by the same company in Europe with the addition "US Version". The game has 6 levels. Almost every level can be assigned to a different genre. In Level 1 you need to fly through a course of rings, in Level 3 on the other hand you need to stop Aliens in Space Invaders style. The game shows the possibilites of design at that time. It is neither extremely elaborate nor extremely outdated concerning the design. Many games from that time had significantly worse looks and some clearly outperform this game. The quality of the level design goes from very good to quite okay. The high point is clearly the soundtrack by Russell Lieblich, which still today knows how to please. The progress of the story is illustrated with text on boards. 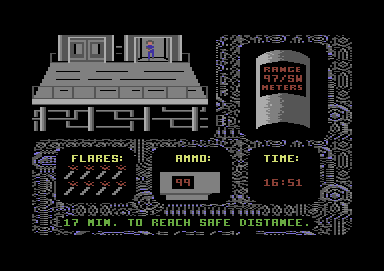 There are also a few nice images in the game, which - at least in the C64 version – are quite good-looking. They show a small clipping from the plot in comic style. Unfortunately, you have to look at these sequences each time as you cannot jump them. Next to it there is a small mini game. In this game you need to pick the pieces of equipment that are shown graphically on the screen. This can be solved easily. The plot of the movie is shown on text boards, which can be switched with the key „Return“. The controls differ from level to level. The whole game is controlled by joystick. If you fail to finish a level you can repeat it with the key “RUN/STOP. In the normal mode the player has already unlimited lives. Points are also not counted. In this level you need to land the landing ship safely on the planet. For this you need to steer the ship on a given path which is marked by rings. If you leave the track too much, the display will go into the red area and you need to restart the level. This level starts very slowly but it needs patience soon. You can repeat this level as often as you like but the difficulty grade is rather high for a 1st level. As you were discovered by the Aliens, you need to get back to the landing vehicle. It waits well parked for the player. Now you have to get to the vehicle with at least one character. You can only make this if you move through the labyrinth fast enough and shoot at everything that moves. The four double screens in the lower part represent the four marines. You can only control one marine at a time. To pick another on press the corresponding key F1 , F3 , F5 , F7 . The marine follows the joystick movements and you shoot with the fire button. A captured marine can be rescued by going to his position with another marine. If two or more marines are at one place, they are safe from attacks. 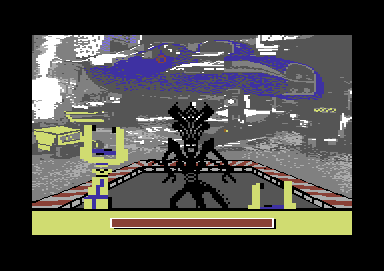 The task in level 3 is to fend off the attack of the aliens. For this you need to eliminate the invading aliens with a flame thrower. Meanwhile, the other people try to seek shelter. So you absolutely need to hold up the aliens until the door is cut through. If you do not make it to destroy all aliens, they will abduct the others. If the last person is kidnapped before the door is open, the level is lost. In this level you need to fight your way through the command centre to contact the second landing ship from there. The blue and golden square represent Ripley and Newt, the white crosses are the marines. The red circles are the aliens. You have 6 grenades that you can use against the aliens, but for each used grenade you lose a marine. 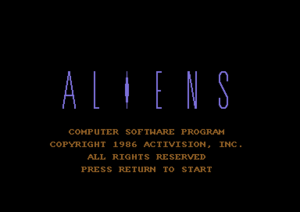 If you are caught by an alien and do not have any ammunition left or there is no marine, then the game is lost. The group follows the joystick movements. To trigger a grenade press the fire button. Newt was captured by the Alien Queen. Ripley comes to the rescue. But there are only 17 min. left before everything will explode. So you need to find Newt, kill aliens along the way and remember the way back (for this you can put down flares). The range locator at the upper right corner of the screen shows the distance to Newt. You have 8 flares and 99 shots of ammunition. Now you need to destroy the Alien Queen with the clutch of an exoskeleton. For this you need to hit her (at best from the side) until the display at the lower border of the screen is green, then you can grab her. When you have her in the clutch, the air lock opens and you can throw her through the lock by opening the clutch. In level 1 note that the rising and falling of the joystick movements is copied from a real plane (joystick forwards = lower, joystick backwards = rise); this can be confusing. In level 2 try to get two or more marines together and search the APC as a group. There are no attacks on a group. In level 3 you cannot walk while shooting, so shoot only if you are standing on the right "track". The aliens can also be stopped without shooting. If you touch them with the flame thrower, they will be thrown back. In level 4 you should avoid aliens, as each time you ignite a grenade, a marine will blow up. In level 5 you do not have to destroy every alien, you can also run away and save valuable time. In level 6 you should grab the Alien Queen from below when the display is green, or else she could get pushed away. By pressing the keys ↑ + Return the current level can be jumped. But then you do not get a mission status code and do not see the end sequence. This cheat is built into the original game and is even mentioned in the manual. The version by "Remember" offers next to different trainers also a manual. Spaceball: "The game is a mingle-mangle of games that you already knew before but were not clad in the alien topic. Alone level 1 is so difficult that you want to cry. For me again a rubbish title!" Robotron2084: "In contrast to my previous speaker, I think this "sequence of mini games" is very successful. (Admittedly badly) digitized images and text messages create an all in all excellent background. The soundtrack is well done and adds well to the story of the game. Here the movie is emulated with meticulous attention to detail, great! 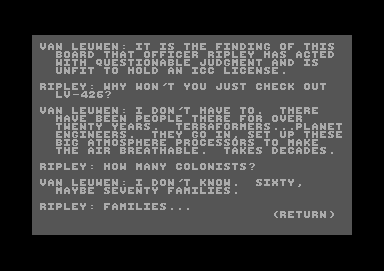 Only the sprites sometimes leave a lot to be desired, but this is compensated by the rest of the graphics. 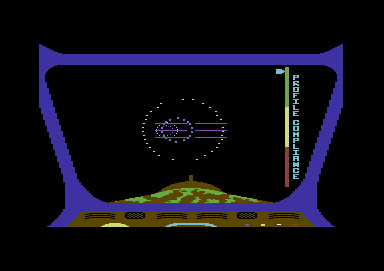 Ah, and I can even do the shuttle sequence while dozing, that’s a mere child’s play. Level 3 and 4 are the killers. Superbly done conversion of the movie, only topped by the game with the same name by Electric Dreams, but more about that elsewhere. 8 out of 10 points." Shakermaker303: "Actually a proper game with much diversity. I find it successful, but the difficulty grade at some places is a bit up to the sky. I got always carried off in Level 4. I had cribbed and found the meander through the labyrinth by "cheating" and then finally came through. It is in any case a nice game with nice end screens/sequence. From me 8 out of 10 points, as I also like the movie and it was correspondingly nicely converted :-)." Unfortunately there is no highscore possible in this game. This page was last modified on 16 June 2017, at 18:36.